The McGill University Faculty of Dentistry will once again be offering free dental treatment, this summer from July 3 to July 26, 2018, for children aged 10 to 17 and for physically or intellectually disabled patients who are 10 or older. 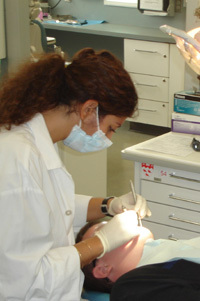 Treatment is provided by fourth-year dental students under the supervision of general practice dentists. Patients can have their teeth checked and cleaned and have minor dental work, such fillings and extractions, at no charge. This service is supported by a grant from the Quebec Ministry of Social Affairs. As this clinic is only four weeks long, we may not be able to complete all the required treatment. Return the completed forms as soon as possible. Patients who are accepted for treatment will be contacted in June to reserve an appointment date and time. If you have any questions, please contact Romantha Descartes, Summer Clinic Coordinator at (514) 398-5017.